Back in 2009, the antiX devs foresaw that usb flash drives would be the wave of the future for live Linux media. 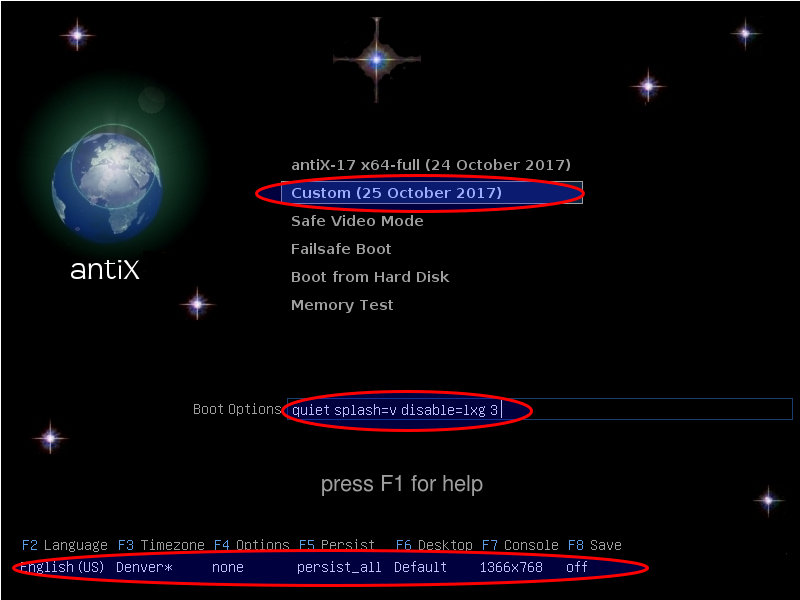 During the ensuing eight years antiX has been refining their live-usb technology striving to improve the live-usb experience and to find new and unique ways for making use of fast read-write live boot media. During this same time usb flash drives have got larger, more reliable, much cheaper, and much much faster. There are no popup menus in the UEFI bootloaders (yet), but we do offer a series of text menus that provide the same level of customizations and these choices can also be saved across reboots of the live-usb. Not all live-usbs are created equal. Our iso files support the creation of live-usbs with the "dd" command, which is often easy and convenient. However, a "dd" live-usb copies the read-only iso9660 file system from the iso file so few of our special live-usb features will work since those features try to take advantage of read-write capabilities of usb flash drives. We encourage you to use the live-usb-maker tool (available for both gui and command line) to make antiX and MX live-usbs. This will ensure you get a full featured live-usb. If you have already made a "dd" live-usb or were forced to boot with a live-cd or a live-dvd, don't worry! The live-usb-maker tool offers "clone mode" which will copy your currently running antiX or MX live system to a new usb stick without a copy of the iso file. If you have an old system that won't boot directly from usb, just make a live-usb clone of your live-cd/dvd, leave it plugged in and on your next boot select "F4 Option" --> "from=usb" and it will finish the boot on the live-usb you just created. This gives you access to most of our advanced live-usb features such as persistence and remastering (but we can't currently modify the bootloader on a live-cd/dvd). Both the command line and gui versions of live-usb-maker allow you to make an encrypted live-usb. 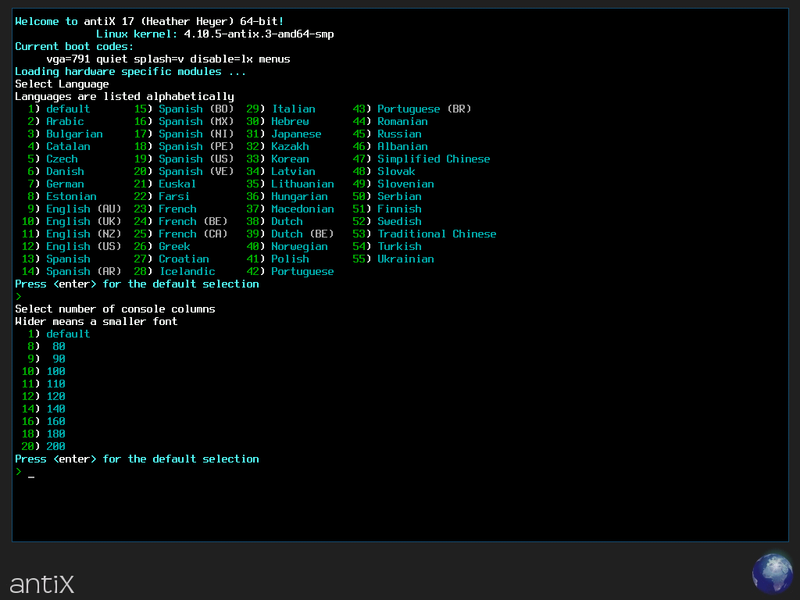 The command line version offers even more options and customization. Live persistence lets you save changes to the root file system and changes to the home file system across reboots. When you select persistence (usually from the "F5 Persist" menu), the persistence files will get set up for you automatically the first time persistence is enabled. Dynamic root persistence saves file system changes in RAM and then copies them to the "rootfs" file whenever the persist-save program is run (it can be configured to always run at system shutdown). Static root persistence saves file system changes directly in the "rootfs" file. This means persist-save doesn't need to run and no extra RAM is used. This is very fast on a usb-3 system. It is okay on a usb-2 system and it can be painfully slow on usb-1. You are free to switch between dynamic root persistence and static root persistence on every boot. On an old system with limited RAM you may want to switch to static root persistence before doing a big system upgrade because there will be no extra RAM cost for file system changes. The live remaster feature provides a slightly more permanent way of saving changes to a live-usb. It creates a new compressed linuxfs file system which contains all of your changes. Typically, someone would use root persistence to store changes on every boot and then after a big upgrade use live remaster to compress all of those changes into the linuxfs file, letting root persistence start over with a clean slate. You can now use the live-kernel-updater tool to change which kernel the live systems boots with. You need to first install the new kernel and do a remaster. The snapshot tool works like remaster, but it creates an iso file. Unlike remaster, it can also be run on an installed system. Using the live remaster tool is sort of like combining snapshot and live-usb-maker in one step without having to bother creating an intermediary iso file. The antiX live system provides a fast, automatic "frugal install" option. This is "to-disk" analog of the toram feature. It copies the compressed file system and a few other things to a existing hard drive (or other) partition. On a fast system, you can do the frugal install and be booted into the new system that was just installed onto your hard drive in under 30 seconds. The live-usb-store feature creates a Live-usb-storage/ subdirectory in your home directory that gives you access to all of the remaining storage space on the main live-usb partition. As root you can control which files get saved by editing the "general-state-files" and "machine-state-files" in the /live/boot-dev/antiX/state/ directory. The general state files are saved and restored on all machines. The machine state files are only restored on the machine they were saved on. For example, if you have one machine that needs a custom xorg.conf file, you can uncomment /etc/X11/xorg.conf in the machine-state-files list and that machine will have its own xorg.conf file that will only be used when the live-usb is booted on that machine. The "toram" cheat puts the compressed file system into RAM so you are free to remove the live boot media. If you combine this with dynamic root persistence then you will be asked to re-insert the live-usb when it is time to save your changes. The "from=usb" cheat allows you to start a boot with a live-cd or a live-dvd and end the boot with a live-usb. We call this a hybrid boot. It provides you with almost all of the live-usb goodies except saving changes to the bootloader. You can also use "from=hd" to boot from a hard drive partition or "from=cd" to boot from a live-cd or live-dvd. The default is "from=usb,cd". The "password" cheat will force you to change the password for the root and demo accounts. This provides an extra layer of security by changing the passwords well before any networking is enabled. On a live-usb you can also edit the general-state-files as described above and uncomment /etc/passwd and /etc/shadow so your changed passwords are remembered across reboots. Instead of packing every conceivable program into the antiX live-usb, we kept it small and lightweight but made it extremely easy to customize. If there are programs you want that are missing from the live system, simply install them via Synaptic or cli-aptiX, do a live-remaster and voilà, it's just like those programs came pre-installed. 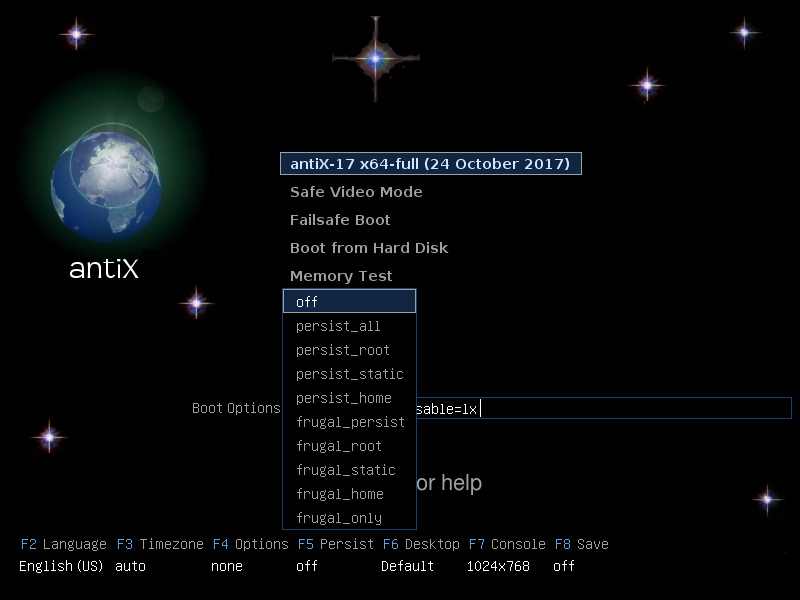 You can view the four flavours of antiX: full, base, core and net as starting points for people to create their own custom systems. Once you’ve customized the system to your liking, you are just a live-remaster or an iso-snapshot away from making it your own. You’ll have your customized system on live media. You can use it to install on other machines, use it as a snapshot/backup of your system, use it as a rescue boot device, or use it to take your system with you in your pocket. 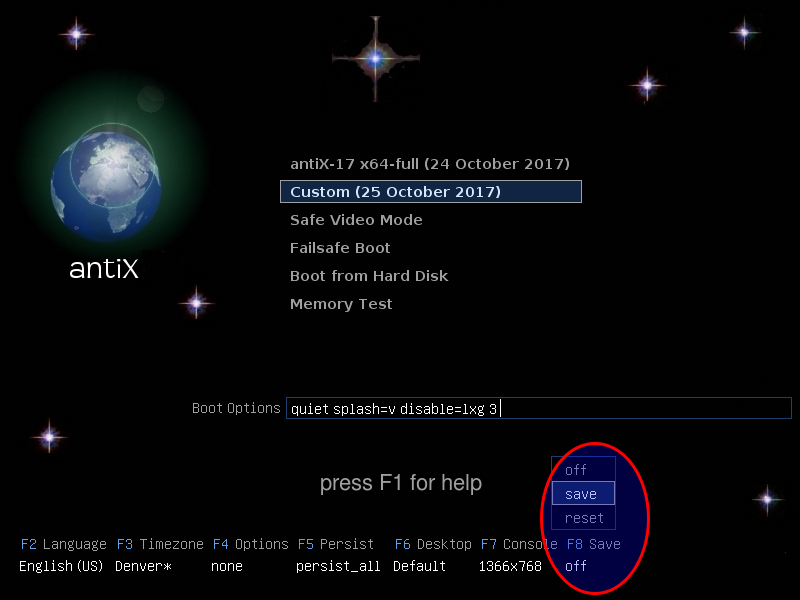 The small footprint, extremely fast booting (getting to a Bash command line in 5 seconds and an X desktop in 12 seconds on a fast system) and easy customization make antiX Linux an extremely good choose for a rescue live-usb as well as for day to day use as a live system. Many people use the live system exclusively and seldom bother to install.